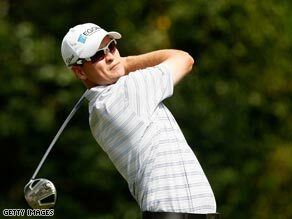 (CNN) -- Zach Johnson shot a remarkable course record 60 during a weather-delayed day at La Cantera on Saturday, to give himself an excellent chance of defending his Valero Texas Open title. Johnson carded an eagle and eight birdies to fire a course record 60 in San Antonio. Threats of lightning in San Antonio brought play to a halt for almost five hours, leaving the top 24 players on the halfway leaderboard to wait until late afternoon to start their rounds. But the wait did little to upset former Masters champion Johnson as he moved from five-under-par for the week at the par-70, 6,896-yard Resort Course to take the overnight lead on 15-under after posting eight birdies and one eagle. After a front nine of 30, starting with a birdie and highlighted by the two he posted at the par-four seventh, holing out from 84 yards, the American shot five birdies after the turn and as darkness descended Johnson gave himself a chance of a round of 59, with a 20-foot birdie putt at the 18th. The putt came up short and, with just the 24th putt of his round, the second 60 of his career went into the books instead after less than four hours on the course. "You've just got to get off to a good rhythm," Johnson told Press Association Sport. "That was really what started the day. To shoot that you have to putt well. I mean you have to make probably three 20-footers and three putts over 15 feet." By finishing before play was suspended due to the fading light, the 2007 Masters champion also gave himself a lie-in on Sunday while his rivals will be returning to the course to complete their third rounds. Johnson has a three-shot lead over halfway leader Paul Goydos and first-round co-leader Justin Leonard, who were called in having played 12 holes. Australian Marc Leishman was on 11-under, four-under for the round, after 17 alongside American Scott Sterling, two-under after 14.